Hands up who thought they’d ever be interested in an electric supercar? Redefining the sector, the new BMW i8 Coupe combines poster-boy looks with the environmental conscience of a vegan. It does 0-62 in 4.4 seconds but returns 134.5mpg. It also emits just 49mpg. It’s a supercar for a new era. The i8 boasts vicious performance, menacing design – and those insanely good running costs. It’s the kind of car that sends your knees weak in the showroom. It’s like no other electric car you’ve seen before. 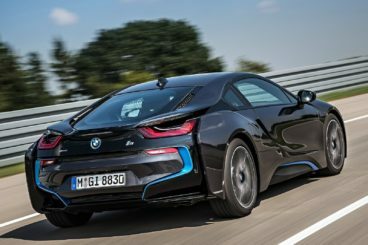 OSV takes a closer look at what it’s all about with our 2017 BMW i8 Coupe review. It’s expensive, we’re not gonna lie. But it offers exactly the amount of performance you’d expect from a sports car with such a high price tag. And although it’s electric, it certainly doesn’t drive like any other EV we’ve witnessed before. True, BMW has made running costs a priority. This means you get to switch to Eco Pro if you want to keep costs down. But you can also switch the driving mode to Sports if you just want pure, scintillating performance. There is also a Comfort setting, which rewards you with both comfort and good economy. We reckon most buyers can’t wait to get their mitts on the Sport mode. Selecting it turns the dash dials to Red, as though to signal aggression, excitement and risk. It’s great stuff that really gets you in the mood for some fun. At the same time, the electric motor and the petrol engine prime themselves to deliver speed. And they don’t disappoint, launching you from a rest to 62mph in a matter of 4.4 seconds. It gets going as soon as you tap the accelerator, too. Time is of the essence. The sound of the engine is a joy to behold. The first time you hear it, you may even be a tad startled. If grandma gets in with you, don’t warn her – just watch her face! We like the automatic transmission. It changes gear seamlessly and quickly. Literally everything about the car is quick. The I8 isn’t one to mess around. Four-wheel-drive is standard – thank God! That extra grip is needed if you’re to be feel confident as you slam into bends. Body lean, meanwhile, is well controlled. The i8 Coupe is certainly visually compelling from the outside, but it doesn’t end there. Inside, the i8 is handsomely put together. Everything is tastefully laid out, from the controls to the infotainment screen. The dashboard has plenty of character, too. It wraps around you, making you feel like you’re sat in a genuine sports car. The blue accents, meanwhile, liven things up and help it to stand out among more conservatively styled rivals. As always, the i8 comes with BMW’s iDrive system, and you can choose from a number of additional trims. Practicality is – somewhat inevitably – the i8’s weak spot. There isn’t much room in the rear, while even getting inside the car is tricky. This is down to doors that open outwards and upwards. And imagine what comedy that creates when you’re parked in a tight spot! Rear visibility is a genuine cause for concern, while the low roofline eats up head space. The driver has less issues, but your passengers won’t be too pleased. That said, your kids will have a ball in the back. The boot measures just 154-litres. There’s not much more we can say about that! Standard is good, and includes a heads-up display, LED headlights, leather trim, climate control and heated seats. You also get an 8.8” screen, a DAB radio, and 20GB of hard drive space with the stereo. 20” alloys and folding door mirrors round things off. For once with a BMW the list of optional extras is short. You can upgrade your leather trim, add a better stereo and some different alloys. But that’s largely it. The car hasn’t yet been put through its paces by Euro NCAP, but we expect it to be safe. Its standard safety kit includes bright LED headlights, and a high-beam assistance system. There is also the usual stuff, such as airbags. Automatic braking is an optional extra, as is object detection. Prices for the new car start out from £106,300 and rise to £116,300. If you prefer to lease, you can pick up a deal from as little as £1,450 + VAT per month. For more information on our lease deals, you can check out our page here. In terms of its running costs, the i8 Coupe is a star. You won’t find sports cars that can return 134.5mpg CO2 anywhere else. Naturally, this is an electric car, so such numbers are kinda to be expected. However, there is a caveat. Those numbers are unrealistic in the real world where you won’t be running on just electric power all the time. If you do want to run on electric power, you can keep going for twenty-two miles at speeds of 75mph max. And maybe then you’ll achieve those dream figures. Otherwise, returns of around 45mpg are more realistic. Which is still excellent for anyone’s money. And, hey, there will be times when you’ll be running on electric power alone. For example, when you just need to nip to the shops. In terms of emissions, the i8 emits less than 50g/km of CO2, which means it’s free to tax. Stick to just electric power and you could return up to 134mpg. Otherwise, you can still expect to average 45mpg economy. It’s the kind of car boys used to pin on their wall next to their Pamela Anderson posters. Despite being electric, the i8 is still mightily powerful and can do 0-62 in 4.4 seconds. No one buys a car like this for its usability. But if you ever take backseat passengers along for the ride, don’t be miffed if they don’t enjoy it as much as you hoped. Naturally, a car like this is loud. But it’s too loud even when you just want to cruise and chill. Let’s see how the car fares against its rivals in the comparison section of our BMW i8 Coupe review. 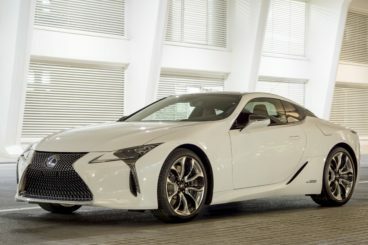 The new Lexus LC isn’t beautiful in the conventional sense, but it’s just as stunning as the BMW. It’s also not the ultimate enthusiasts car, but a powerful V8 engine ups the ante in a sector already awash with hell raisers. This is technically a Grand Tourer, which means you’re not going to get the accurate steering of a sports car. There are two versions available – a V8 engine that develops 467bhp, and an impressive hybrid. The former does away with 0-62 in 4.5 seconds, while the latter does it in around 4.8. Both have serious chops, and it’s going to be hard to choose between the two. However, if you prefer rear-wheel-drive, the V8 is your best bet. The LC lets you switch between 5 driving modes, ranging from Eco to Sport +. There is lots of grip on offer, and the steering lets you place the car with confidence. However, the steering isn’t free from criticism. It ultimately lacks feel, and doesn’t involve you in the experience as much as the i8 Coupe does. The 5.0-litre V8 petrol engine is more of a luxury than anything else. It returns 28mpg economy at best, and costs £500 a year to tax. Hefty. Step inside and you’ll be greeted by a plush interior. The materials used are of a high quality, and the smart design has been ably executed by Lexus’ team. Leather and Alcantara make you feel highly welcome, while we think buyers will enjoy the clinical mix of black and dark rose leather upholstery. It’s very stylish. A criticism would be that there are too many buttons on the dashboard. The Remote Touch control which you use for the infotainment system, meanwhile, is too pedantic. But while the ride is firm, the Lexus LC isn’t what you’d call uncomfortable. There’s not a whole lot we can say in favour of the car’s practicality. Space in the rear is tight, while accessing them in the first place is tricky. The boot is tiny, measuring just 197-litres. Opt for the hybrid model and you only get 172-litres of space. 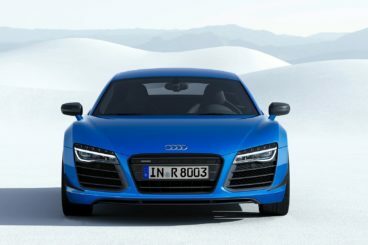 The new Audi R8 snarls, prowls and pouts. It’s a mean-looking machine that’s powered by a titanic V10 engine that sounds absolutely glorious. This is a popular supercar, and it’s no surprise: It’s insanely fast and great fun to drive. It’s dramatic, loud, and full of character. It has more energy than the periodic table, and works well as both a cruiser and a speed demon. There are a few deficiencies, most notably the stiff ride. But we reckon most people will overlook a bit of discomfort when they fire up the 5.2-litre V10 engine. You can get this bad boy in two power guises, starting out with a 533bhp variant. It does 0-62 in 3.5 seconds and maxes out at 205mph. The 602bhp variant maxes out at the same speed, but does 0-62 in just 3.2 seconds. Four-wheel drive is standard on both models, as is a 7-speed twin-clutch automatic transmission. Grip is excellent, which means you can approach bends at pace full of confidence. It was always unlikely that the R8 Coupe would be cheap to run. But despite now sporting an even bigger engine before, economy has been improved. That’s probably not saying much when the best it can return is 24.8mpg – and even then, these figures are official ones that aren’t realistic. What can’t be argued with is the £515 yearly road tax bill you’ll be saddled with. Still, that seems like small change after you’ve splashed out over £120,000 on the car itself. Inside, the R8 Coupe benefits from Audi’s Virtual Cockpit, which really does make the interior a special place to be. It features a massive 12.3” screen that’s ostentatious to say the least. There are touches of luxury everywhere, and we love the way the dash wraps around the driver. The sports seat are another highlight, and you can’t move for brushed aluminium and carbon fibre inserts. In terms of practicality, the Audi R8 Coupe doesn’t fare too badly. It’s only got two doors, so you can’t expect too much. There are no rear seats and the 112-litre boot (situated at the nose) is small. But it’s a deep boot and comes with a narrow opening for ease of use. Audi have also added a small shelf for extra storage behind the seats, while a few door bins and some cubbies make up decent storage space. Stunning and totally ridiculous in every way. Okay. We’re big fans of the new, partly electric BMW i8 Coupe (if you can’t already tell). It’s got admirers all over the world. And if you can afford it and quite fancy a new toy, there aren’t really any reasons to say No to this one. The BMW i8 Coupe represents your chance to raise Hell while looking after the planet with low emissions. Are you going to take it?